I thought I would make a recipe up that was easy, no fuss and delivered big on flavour and tender moist chicken. I decided I would go with a pineapple flavour, and have the chicken and pineapples lovely and caramelised during the baking, making the chicken a little sticky sweet on the outside and real moist and tender when you eat it. I based the sauce on a slight sweet and sour flavour, and because the chicken is cooking in the sauce, you have the flavours coming through every part of this dish. It really was a delight to eat and super quick to prepare. Chicken Thighs or Drumsticks. Allow 2 – 3 per person. 2 Tablespoons flour ** if you are using more liquid, you will need to use more flour or cornstarch to thicken the sauce. 2. Wash and prepare the chicken in a suitable oven proof dish. Allow enough space for the chicken to sit separate and also to hold the sauce. Pour over the pineapple juice. Add salt and pepper to the chicken if you wish. 3. In a jug, add the stock cube to the hot water to dissolve it, then in a bowl, add the flour and enough cold water to make it into a paste. Once done, add the remaining ingredients for the sauce and stir to avoid any lumps. Add this to the jug of hot water & dissolved stock cube. 4. 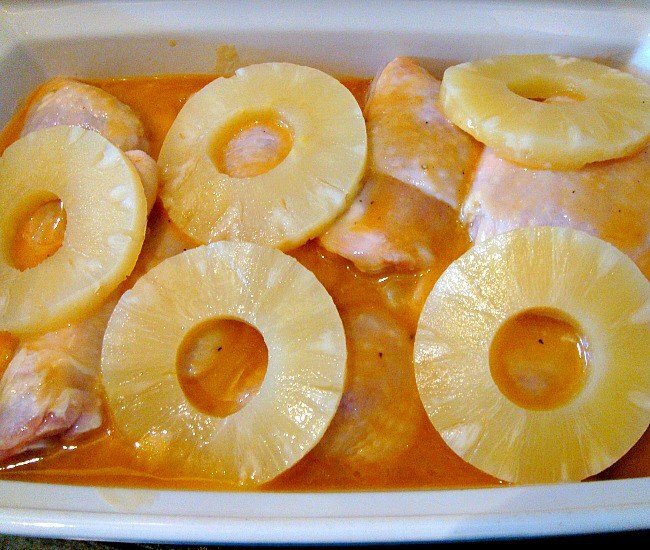 Pour the sauce all over the chicken and then arrange the pineapple rings how you like. 5. Place in the oven for 60 minutes. Halfway through cook time, you may want to move the pineapple rings a little so the skin underneath browns evenly. The chicken will look like it is burnt, but in fact it is the sugars & pineapple caramelising, so please don’t worry! Serve with my Delicious Cous Cous, rice or whatever you like! I thought I would make a recipe up that was easy, no fuss and delivered big on flavour and tender moist chicken. 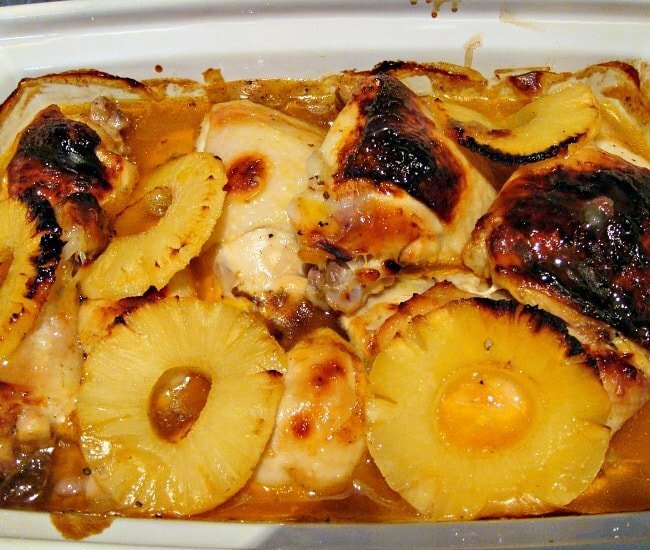 I decided I would go with a pineapple flavour, and have the chicken and pineapples lovely and caramelised during the baking, making the chicken a little sticky sweet on the outside and real moist and tender when you eat it. I based the sauce on a slight sweet and sour flavour, and because the chicken is cooking in the sauce, you have the flavours coming through every part of this dish. It really was a delight to eat and super quick to prepare. Chicken Thighs or Drumsticks. Allow 2 - 3 per person. cup The pineapple juice from the can of your pineapples about 1 or so? 2 Tablespoons flour ** if you are using more liquid you will need to use more flour or cornstarch to thicken the sauce. Wash and prepare the chicken in a suitable oven proof dish. Allow enough space for the chicken to sit separate and also to hold the sauce. Pour over the pineapple juice. Add salt and pepper to the chicken if you wish. In a jug, add the stock cube to the hot water to dissolve it, then in a bowl, add the flour and enough cold water to make it into a paste. Once done, add the remaining ingredients for the sauce and stir to avoid any lumps. Add this to the jug of hot water & dissolved stock cube. Pour the sauce all over the chicken and then arrange the pineapple rings how you like. Place in the oven for 60 minutes. Halfway through cook time, you may want to move the pineapple rings a little so the skin underneath browns evenly. The chicken will look like it is burnt, but in fact it is the sugars & pineapple caramelising, so please don't worry! Serve with cous cous, rice or whatever you like! What kind of vinegar do you use for this recipe? I used white wine vinegar. Hope that helps! Did you leave the skin on? Maybe that is what looks burned bit non-skinned area do not. ??? Hi Jo, yes , I left the skin on because I wanted the sugars from the pineapple to caramelise (that is what gives it the darker colour you see in the photo) over the skin. So don’t worry, it isn’t burned, it is the sugars from the fruit. You can use no skin, too, but of course you won’t get the nice colouring. Really like the pineapple. and the caramelization looks great! Peter of Feed Your Soul Too. Thanks Peter, I’m glad you like the recipe! I am always looking for chicken recipes, looks amazing!! Yummy and caramelized! Thanks Nettie. I’m so happy you like it! Thanks for your comments. I am not sure why it is not caramelizing / browning. 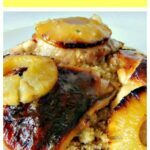 As you will see from my photos, the chicken certainly caramelized and I wrote the recipe up exactly as I did it. The only thing I can think of which may have caused a difference is the variation of oven, or the oven was not hot enough when you placed the chicken in so it would take a little longer than stated in the recipe. Please do let me know how it turned out. Hi Brandon, that’s great news! 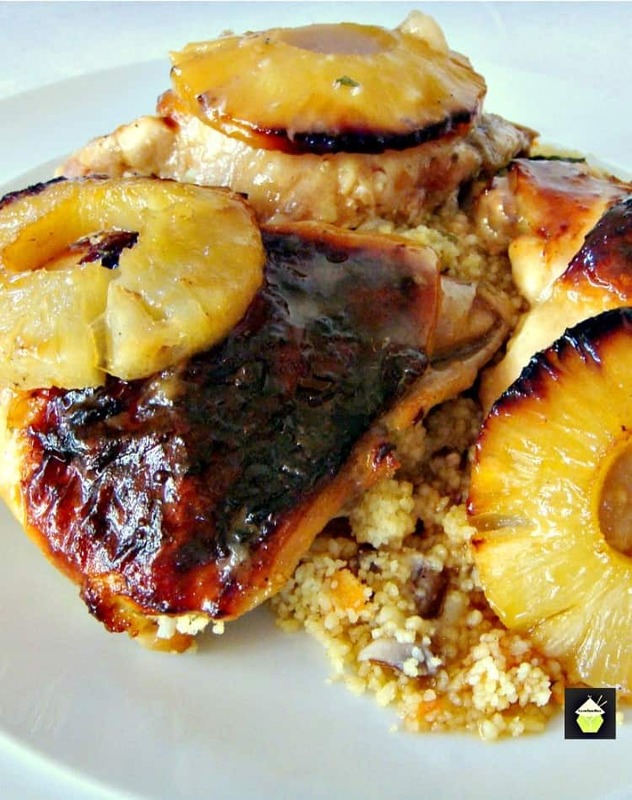 I have made these on the grill before and it is even better as you get the pineapples and sugars really caramelising nicely on the grill (with the lines too!!) What I would suggest for grilling, if you are using thighs or legs is to slash a couple of cuts in the flesh so it cooks nice and evenly in the bone part of the meat, otherwise you could end up with a charred top and under cooked middle. But it’s certainly really delicious on the grill! Happy grilling to you and your family! Will it work if you just use chicken breasts? Hi Tina, yes of course. You may need to reduce the cook time as the breasts will take less time to cook, but they should still be moist from the marinade and sauce. Looks delish, making this soon!!! Pinned, shared, printed and emailed!!! You will love it Vikki!